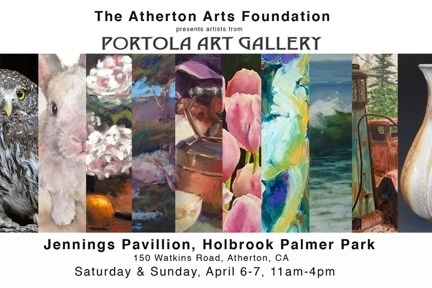 The Atherton Arts Foundation is hosting artists from the Portola Art Gallery in Menlo Park next weekend at the Jennings Pavillion at Holbrook Palmer Park (150 Watkins Rd. Atherton). There will be a reception for the artists on Friday, April 5, from 5:00 to 8:00 pm featuring art, wine, food and music. The art show is open Saturday, April 6, and Sunday, April 7, from 11:00 am to 4:00 pm. Participating Portola Art Gallery artists are Larry Calof, Inna Cherneykina, Marsha Heimbecker, Misako Kambe, Terry McMahon, Yvonne Newhouse, Jerry Peters, Jan Prisco, Linda Salter, Teresa Silvestri and Mary Stahl.